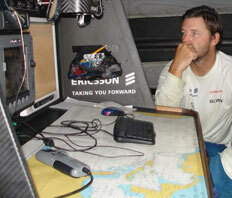 in the 2004 - 5 Volvo Ocean race. At a media breakfast, during the Baltimore stopover, Team Ericsson Racing’s Damian Foxall and Richard Mason (left) talked about life on board a Volvo Open 70; the food, the watch system, hygiene, safety, technology and environmental observations. 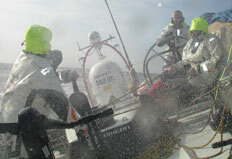 Lori Pierelli went along, for BYM News, to get a first hand insight into life in the Volvo Ocean Race. 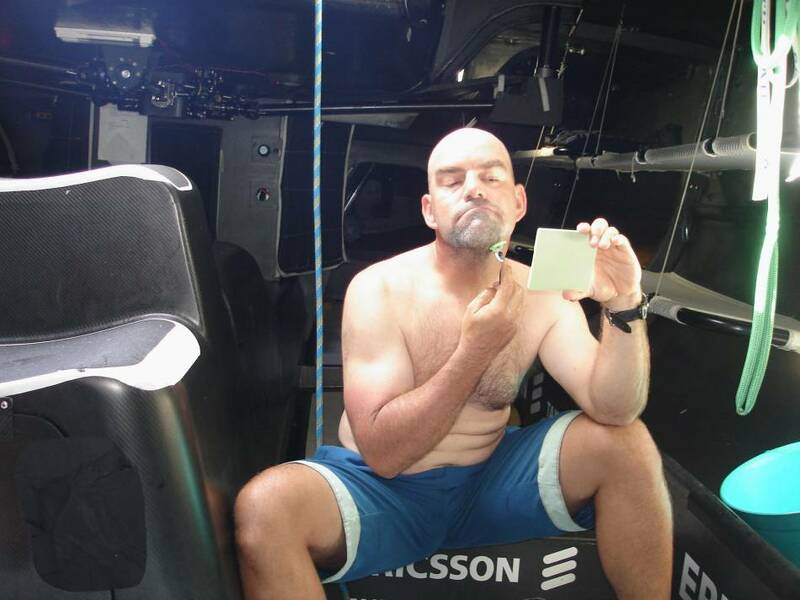 New Zealander, Richard Mason, is one of two medics on board the Ericsson yacht (the other is Magnus Woxen) and he began by describing	their	preparatory training. "We spent a week with triage doctors, in Stockholm, had two days of basic training and were then thrown into a hospital Emergency Room for two days, working side by side with the doctors." 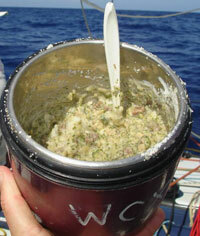 Richard was less enthusiastic about the on board food, than he had been about the medical equipment.”Disgusting!” was his summing up “Usually, two hot meals a day - that is hot in terms of boiling water added to freeze-dried, but it does depend on the leg. 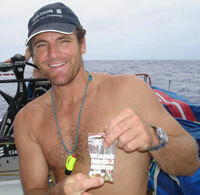 Cold meal is usual muesli.” On the Rio to Baltimore leg, they had a hot meal in the morning and evening and a cold one in the middle of the day, because it was so hot. The watch system means that not everyone eats at the same time, so the food is prepared and then stored in an airtight container. They also eat protein bars. Some people are sleeping when meals are being cooked, so food is prepared and put in thermos-like container, so each person can get their food as the wake or come off watch. Even when preparing the next meal, you’ll sometimes find leftovers in a thermos that someone didn’t get around to eating. Everyone is supposed to be responsible for cleaning up, but doesn’t always happen. 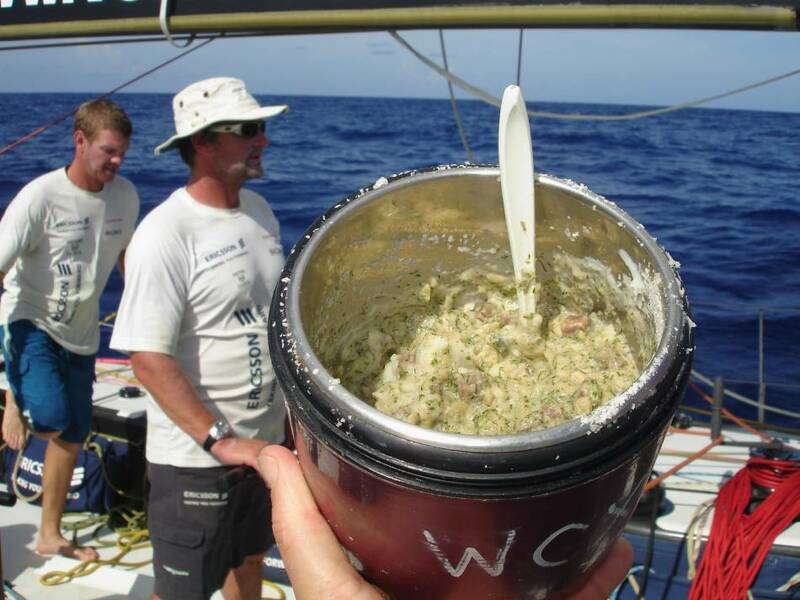 Provisioning for each leg is discussed at crew meetings and all food is vacuum-packed in dry bags, theoretically to keep it fresh and dry, but it still gets “trashed”, because everything gets shifted back and forth during manoeuvres. Everyone is essentially responsible for everything, but there is a “minister of the interior”, who tries to keep track of where everything is; not an easy thing to do. The only things that never get shifted around are the emergency equipment and tools. The watch system is four hours on, four hours off, with a watch change every two hours, so they can change sails on a regular basis, with two fresh guys always coming up on deck. 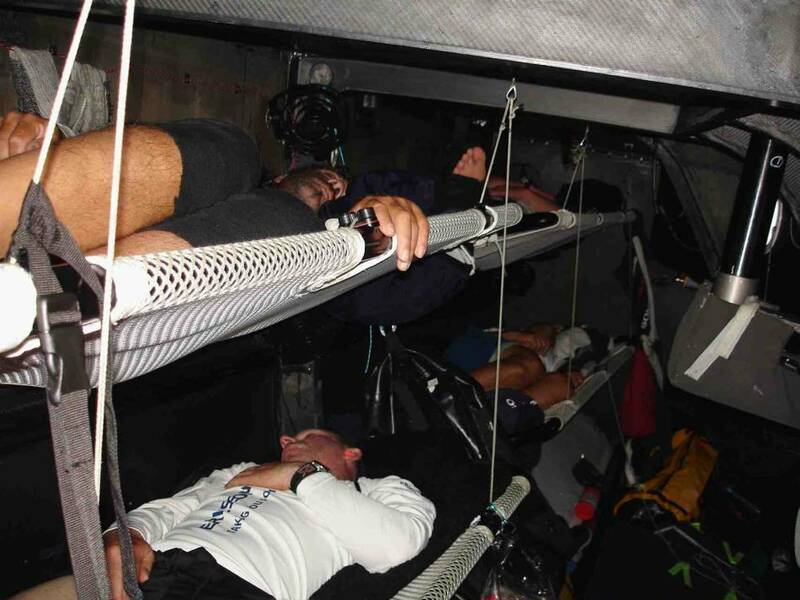 One hour of sleep is about average, even though the watch system is, on paper, designed so they get at least two hours, it takes a half hour to get dressed, sail changes happen at watch changes and every sail change takes about an hour, because there’s so few crew. 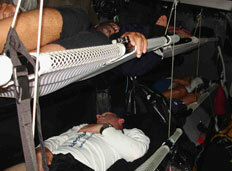 “So basically on these boats, there’s no sleep.” said Damen Foxall “On a good watch, you might get 2 to 2 1/2 hours sleep, on a bad day 20 minutes.” When on land, though, they get ten hours’ sleep; their bodies adjust to the unique patterns on the boat, and “catch up.” when they get ashore. Foxall says there is a lot more seamanship involved now “Before it was, head for the nearest low and get the boat going fast, now you don’t necessarily need all that wind. 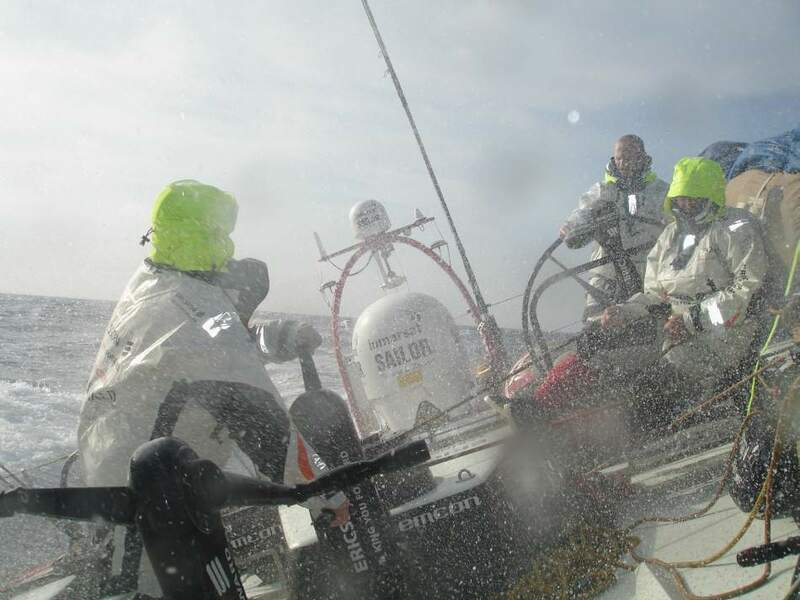 A lot of times, the boat can go faster than the crew can physically stand.” The worst nightmare, “always in the back of minds and, if it isn’t, it should be” says Foxall, is going overboard. Prevention is the important thing and, mostly, they wear a standard clip on harness, but if it gets really rough, or at night, they wear harnesses with life jackets in it. 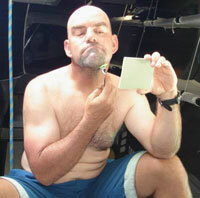 Each crew member has an individual EPIRB, with directional finder and GPS, each coded to the sailor. Each carries a small bag, with dye marker, flash light and knife. Safety training takes all eventualities into consideration and there are “crib sheets” on what to do in case of capsizing, dismasting, fire, abandon ship. All have standard procedures and everyone is responsible for their own area. 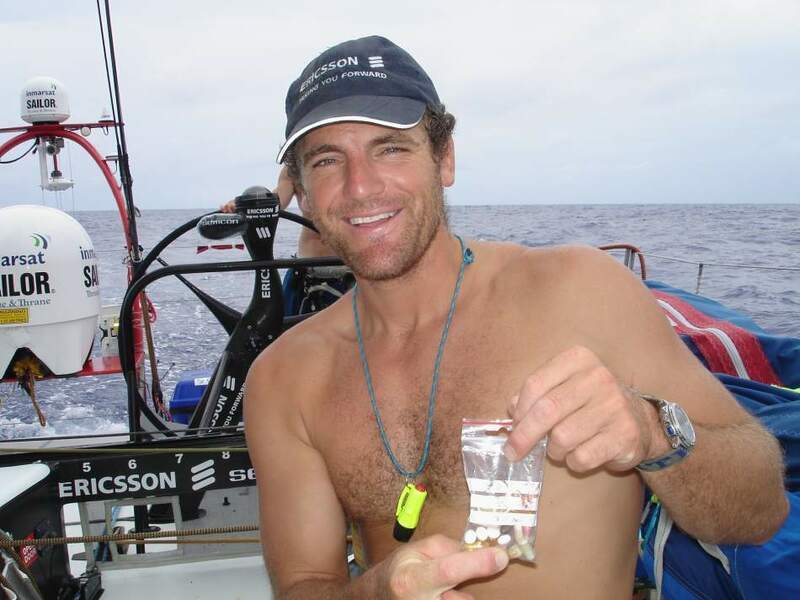 Grab bags are now taken more seriously; in the past it was a case of “Go through the race requirements, put the necessary equipment in the bag, leave it in the bottom of the boat and you don’t think about it until the end of the race; now we put in our own additions. Standard equipment includes satellite phone, standard set of flares (orange smoke flare for use during day), red flares, white collision flares to be used at night, flashlight. There are two 14-man liferafts and medical and food supplies in grab bags. Technology is another important issue. Ericsson got struck by lightning on the way into Wellington. Everything was blown for the rest of the leg, white smoke was coming out of all of the computers. The only thing that survived was the control for the keel system and one computer that wasn’t hard-wired in; basically everything that was connected in some way to the mast stopped working. Foxall said “When you live and work for a large part of your year outside of civilization, you see the contrasts so quickly over a nine-month period. Offshore for three weeks you see nothing except waves and wildlife and then you come ashore and get a couple days off in the mountains or at the beach and it changes so quickly, it’s quite a stark contrast you see. You notice it a lot more.